Silicone breast implants (SBI) may induce systemic autoimmune disease as part of autoimmune syndrome induced by adjuvants (ASIA). This syndrome bears similarities to fibromyalgia and chronic fatigue syndrome (CFS). We sought to determine whether there are any associations between SBI and depression, fibromyalgia and CFS in a rheumatology clinic population. 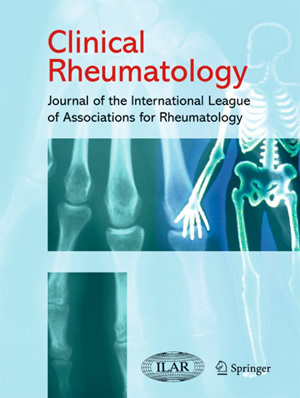 The electronic files of rheumatology clinic patients at the Royal Adelaide Hospital between 2000 and 2017 were searched for patients who had received SBI prior to rheumatological diagnosis. Demographics, diagnosis, implant history and whether the patient had depression, fibromyalgia or CFS were recorded. Controls were rheumatology clinic patients, half of whom had systemic sclerosis (SSc) and the other half had systemic lupus erythematosus (SLE). They were matched to cases 3:1 for age (within 2 years) and gender. Thirty patients had received SBI (mean age 47.9, 100% female). Twelve had a diagnosis of depression, 6 of fibromyalgia and 3 of CFS. Implant rupture was not associated with any of these (p = 1). There was no difference in the incidence of depression (p = 1), fibromyalgia (p = 0.76) or CFS (p = 0.3) between cases and SLE controls. When compared with SSc controls, there were significantly more patients with fibromyalgia and/or CFS in the case group (20.0% of cases vs 2.2% of SSc controls, p = 0.01) but no difference in depression (p = 0.12). Fibromyalgia and CFS are more common in patients with silicone implants than SSc controls but not SLE controls. Prospective study of development of depression, fibromyalgia and CFS in recipients of SBI is required.